For more information about the RiteCare® of Minneapolis-St. Paul Grant Program and for instructions on how to apply for a grant, click here. In the early 1950s in Colorado, the Scottish Rite of Freemasonry of the Southern Jurisdiction of the United States initiated a program to help children with speech and language disorders. The results obtained from this program led to the establishment of RiteCare® clinics to provide diagnostic evaluation and treatment of speech and language disorders, as well as learning disabilities. ​Today, there are 178 RiteCare® programs operating throughout the United States. Each program operates independently, and relies heavily on local donations. With the support of individuals, communities and local foundations, these programs continue to increase in number. The value of this philanthropy has long been apparent; tens of thousands of youngsters across the United States have been helped significantly. With the good work of dedicated clinicians and parents, RiteCare® has achieved successes that could only be imagined a few years back. Children who might have remained educationally behind for a lifetime can now talk, read, and lead productive lives. RiteCare® of Minneapolis-St. Paul was started in October, 2003 as the Scottish Rite Childhood Language Clinic of Minnesota, Inc. and opened a RiteCare® Clinic in Elk River, MN the following year. This RiteCare® Clinic helped over 200 children during its eight years of operation, however, in late 2011, the RiteCare® Clinic was closed, and the RiteCare® Grant Program was initiated. 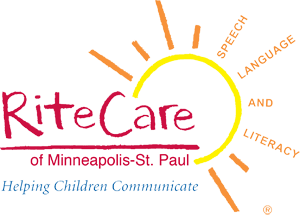 In September, 2012, The Scottish Rite Childhood Language Clinic of Minnesota, Inc. changed its name to RiteCare® of Minneapolis-St. Paul to reflect its new direction in helping children with speech and language disorders.